The SF Fine Arts Hall, lit blue in honor of World Autism Awareness Day. 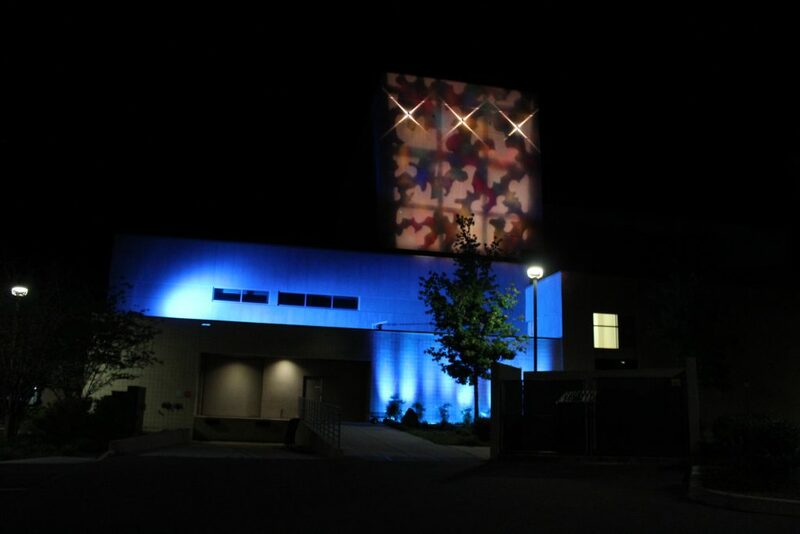 April 4, 2019 – Students in Santa Fe College’s Fine Arts programs spent their Wednesday lighting the exterior of the SF Fine Arts Hall blue in honor of autism awareness. The event, which was originally scheduled for April 2 to coincide with World Autism Awareness Day, was moved to Wednesday because of the threat of inclement weather. SF Senior Instructional Specialist in Lighting Design, Liz Reynolds, said the class project gave students the opportunity to experience different challenges in lighting based on location, and gave them a chance to make an artistic statement about the issues that affect them. In addition to students in the Fine Arts programs, students involved in SF’s Spectrum of Success program, which is designed to help students on the autism spectrum, also participated in the event.